So What's Inside Yoplait Yogurt Anyway? Yoplait is ubiquitous and has a very healthy (and European) image. But, you can't judge a book by its cover. My friend, Hemi, over at Fooducate gave me this post for Snack-Girl readers. I think his site is very important for helping people understand what is in processed food. A few vitamins and minerals to boot. Yes, we’ve highlighted the added sugars, which we’ll get to in a minute. The front of the yogurt label boldy claims it is 99% fat-free, leading a person to expect a very low calorie yogurt. Instead, 170 calories. Not a lot, but not close to zero either. Note though, that 108 of these 170 calories are from sugar! In context: By weight, 17% of this product is sugar. 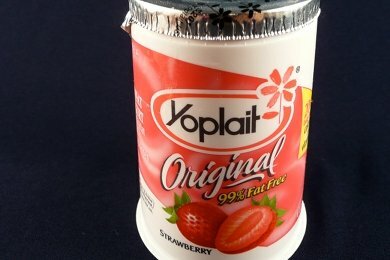 63% of the calories in Yoplait Strawberry Yogurt are from sugar! Sounds more like a snack or treat than a health food. The four sources of sugar in this yogurt (by their weight in the ingredient list) are yogurt/milk (lactose), table sugar, the strawberries themselves, and high fructose corn syrup (let’s not get into that controversy here today). To be fair, one can purchase the Light version of this yogurt, artificially sweetened, and with only 14 grams / 64 calories from sugar. 1. what’s the fruit content as a percentage of the ingredients in the yogurt? 2. how much sugar was added to this product, beside the natural sugars found in the yogurt and strawberries? 3. Just what are those natural flavors? 4. It would be nice to know just what Tricalcium Phosphate and Carmine are too, but obviously there is not enough room on the nutrition label. There’s certainly enough room on the website, though, so why not educate us consumers? Read, read, read the nutrition panel and ingredient list. You’ll be surprised how much better your choices can become. Go read Fooducate for more posts about what is in our food! Please share your favorite brand of yogurt below. Four words- Brown Cow Greek Yogurt. It is by far the best I have ever tasted. The strawberry is a little high in sugar but the vanilla is sooo good and it only has 11 grams of sugar per serving and 13 grams of protein! To make it fruity just mix in your own fruit sweetened with a bit of agave. This is why I only eat Fage 0% greek yogurt. There's only two ingredients: skim milk and cultures. No worries, Stephv. I hope to feature some better choices that cost the same or less - and are as easy to find. I think it is great that you already recognize this as a dessert food - most people think of it as a healthy snack. What is usually called 'Greek yoghurt' is a very particular form of yoghurt here in Greece, called 'drained yoghurt' (i.e. drained of water). So my policy is to have less quantity but enjoy the full-fat version (10%) which tastes wonderful. If you want strawberries or apricots or bananas, why not just add them on top? Any flavoured yoghurt, and any very homogenised runny yoghurt, is suspect. I've been shopping around trying to find a yogurt that after I eat it, I don't feel so tired that I have to take a little nap -- even at my desk, which is not a good thing. I've been eating Yoplait for 3 days now at lunch and have gotten very sleepy.... too much sugar!! It's almost laughable to compare these ingredients with Fage and other authentically Greek yogurts http://fage-greek.blogspot.com/2011/06/popular-kinds-of-greek-yogurt.html. As for the whole "Greek is much more expensive than Yoplait, no; it's not: consider what you save on heart disease treatments! Just an FYI, carmine is a "natural" (it is extracted from cochineal beetles) red food coloring that is sometimes used in place of the toxic Red 40. Yoplait yogurt is one of the worst. The best I have had was Rocky Mountain High when I lived in Colorado but it isn't available in Louisiana unfortunately.